Abstract. The Seychelles Fody Foudia sechellarum, which occurs on six islands in the Seychelles, has been well ringed over several decades in order to obtain population estimates for the species, and morphological descriptions and measurements. Annual survival estimates for the species vary from 71.5% to 85.7% but the species' longevity has not been reported. 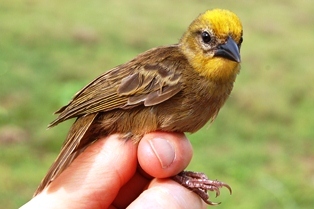 The oldest recaptured Seychelles Fody was ringed on 28 June 1997 and recaptured on 9 May 2002, when its ring was replaced, and recaptured again on 19 September 2011. The age of the bird at first ringing is unknown. The elapsed time between ringing and last recapture of the bird was 14 years 2 months 25 days, providing a minimum longevity record. In addition, four other birds had maximum elapsed times between banding and recapture of >10 years, 11 of >9 years, and four of >8 years. Read more about the Seychelles Fody here. Read more about the ringing trip here.